Libya’s new prime minister has warned that the country’s civil war is not over, as new figures estimated that 30,000 people had already been killed in the conflict. Mahmoud Jibril, whose formal title is chief executive of the National Transitional Council, spoke publicly for the first time in Libya’s capital Tripoli since rebel forces seized it from the Gaddafi regime last month. He gave an explicit warning to rebel leaders not to start “political games” until the war was over â€“ a key concern as different rebel factions jockey for position in the new Libya. He threatened to step down if the rebels did not unite around the mission to defeat the regime remnants. Mr Jibril’s failure to arrive in Tripoli and his decision to spend much of the last month meeting foreign leaders abroad had attracted much criticism, including from his own NTC colleagues. Earlier, officials indicated the full measure of the damage that the war, which started as a series of protests against police abuses, had inflicted on the country. Naji Barakat, the acting health minister, said that counts from hospitals, government officials and rebel commanders amounted to 30,000 dead and 50,000 wounded. He also said 4,000 people were still missing, though that was much lower than estimates of 10 times that many a week ago, which gave rise to fears of thousands of prisoners lost in secret jails. Graves are still being discovered across Tripoli of apparent victims of the regime, including prisoners believed to have been killed by members of Libya’s most feared military corps, the Khamis Brigade, as it fled. But Mr Barakat said around 9,000 members of the Brigade had been killed in the war. It was a particular target for Nato bombing raids. In other developments Col Gaddafi made another telephone call to a Syria-based television station in which he denied that he had fled Libya. There had been reports he might have been preparing to join a convoy of loyalists who escaped this week across the border with Niger. He said the reports were a form of “psychological warfare”. “We are ready in Tripoli and everywhere to intensify attacks against the rats, the mercenaries, who are a pack of dogs,” he added. Interpol was asked by the International Criminal Court to issue “red notices”, international arrest warrants, for the Colonel, his son Saif al-Islam, and his closest long-term aide, Abdullah al-Senussi, who have all been indicted. Meanwhile, the new governor of Libya’s Central Bank, Qassem Azzoz, said that the regime had sold a fifth of its gold reserves, or 29 tonnes, as the rebellion took hold to pay salaries, but that thanks to the release of bank notes this week by Britain, there was no liquidity problem in the country. 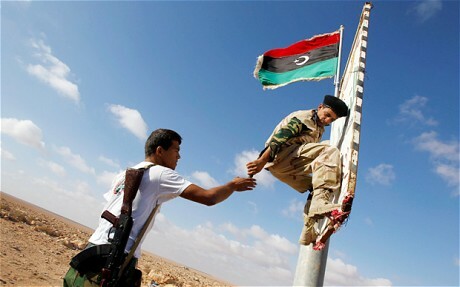 The continuing battle for Libya currently focuses on two towns holding out in the north â€“ Sirte and Bani Walid. But the battle for the desert south of the country, where Gaddafi is almost certainly hiding, could be much tougher. NATO’S secretary-general, Anders Fogh Rasmussen, said its military involvement would continue.